Roasting a whole chicken is one of those things that seems very intimidating until you actually do it. I have to stick my hand where? Which side faces up? How long do I cook this thing? What temperature? What if it’s too dry? What if it’s not done? Oh my god I’m going to give people salmonella! I promise, it’s not that complicated. 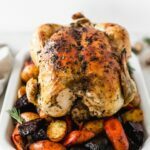 Once you’ve roasted a chicken a couple of times, it will become second nature, and you’ll be picking up whole chickens at the store like it’s nothing for your go-to Sunday dinner. Whole chickens are great because you only have to cook once to yield a lot of meat, they’re affordable, and the bones are great for making homemade bone broth. So let’s do this thing. Okay, unwrap your chicken and reach in the inside and remove anything that’s inside the cavity. Ew, ew, ew. Yep, it’s gross. But just do it. Now you’re done with the gross part and we can make a chicken! First off is the brine. The brine is very important for a juicy chicken. But it doesn’t have to be complicated. I stick with a basic salt, sugar and water brine. Just dump it into a big bowl to cover the chicken and let it sit and soak up the juiciness for a while (in the refrigerator of course). Once you’re about ready to cook, remove the chicken from the brine, pat it dry, and let it rest in the fridge again to let the skin get nice and dry. This whole process makes for a crispy skin and tender inside. Next, the flavor. Again, I like to keep things pretty simple. I use a combination of thyme and rosemary, garlic, olive oil, lemon, s+p, and olive oil. Easy peasy but so flavorful. Rub that ish all over the outside of the chicken AND under the skin. Then stuff the cavity with the squeezed lemon, some garlic cloves and more herbs. Tie the legs together with some kitchen twine if you want, or don’t. Either way is fine. Okay, now for the cooking part. You want to start with a pretty hot oven to give that skin a head start on crisping up. Then you’ll turn the heat down a little so that the inside can cook thoroughly without drying out. This is also when you add the root vegetables, so everything can cook all together as one happy family. But when do I take the chicken out? Great question. The best way to tell is with a thermometer. If you don’t have a kitchen thermometer I suggest you get one asap. It’s the best way to consistently cook meat and poultry perfectly without overcooking (or worse, undercooking). When the chicken reaches 165°F, it is done. You’ll want to check both the breast and thigh to be sure. Once your chicken is done, remove it from the oven and place on a large cutting board to rest. If your veggies aren’t done yet, continue to roast them until they are. Then carve the chicken, serve with the roasted vegetables and a sprinkle of feta, and dinner is done! 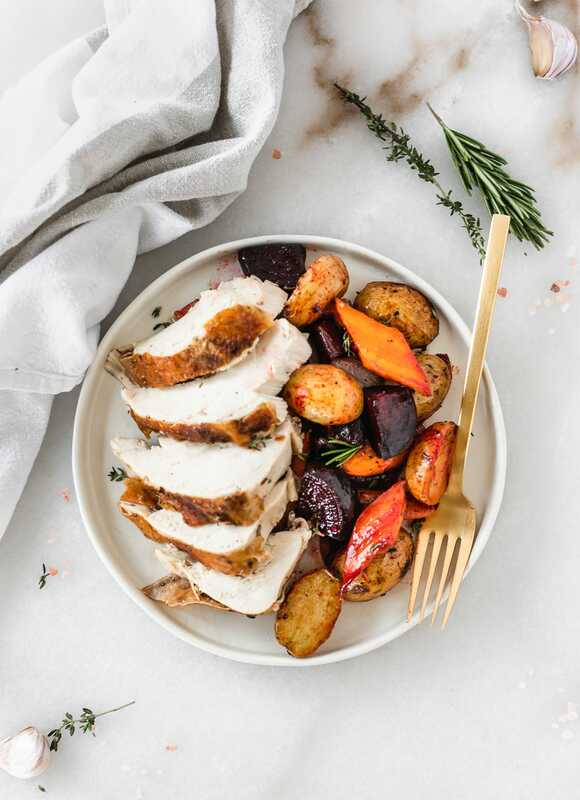 You have a perfectly tender, juicy, and flavorful chicken with hearty roasted root vegetables – a complete dinner that cooks in the oven all at once! And you look like a badass in the kitchen. Now that wasn’t so hard, was it? In a large bowl, combine salt, sugar, and lukewarm water. Clean chicken and place in bowl, making sure it is completely covered in water. Let chicken brine in the refrigerator for at least 2 hours. Remove chicken and discard brine an hour before you are ready to cook. Pat chicken dry with paper towels and place on a plate in the refrigerator. This will help the skin crisp. Heat oven to 425° F. If using a cast iron skillet, place it in the oven to preheat. In a small bowl, combine thyme, rosemary, 2 chopped garlic cloves, juice of the lemon, olive oil, salt and pepper. Rub the mixture under the skin of the chicken and all over the outside. Stuff the cavity with remaining clove of garlic, lemon peels, and additional springs of herbs, if you have them. Truss the chicken with kitchen twine (optional). Place chicken in heated skillet or a roasting pan, breast side up. Roast chicken at 425° F for 20 min. Turn the oven down to 400° F and continue to cook until done (about 30-45 minutes or 15 minutes per pound), checking often. A thermometer inserted into the thickest part of the breast should read 165° F when it is completely cooked. Meanwhile, dice your root vegetables evenly. Spread vegetables evenly onto a baking sheet lined with parchment or a silicone baking mat and sprinkle with thyme, salt and pepper. Once you turn the oven down, baste vegetables with drippings from the chicken and place vegetables in the oven. Baste once or twice through cooking, stirring each time. Alternatively, you can spread vegetables in the roasting pan around the chicken and return the dish to the oven to continue cooking. Stir veggies every 15 minutes or so. 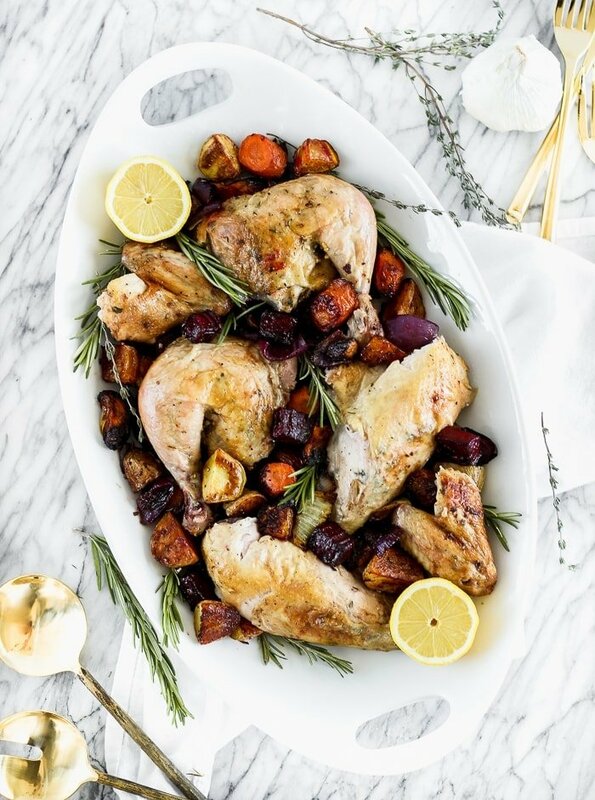 Once chicken is done and veggies are cooked, remove from the oven and serve! We like to serve the vegetables with a sprinkle of feta cheese.